How does the machinery of government respond when a King steps out of line? 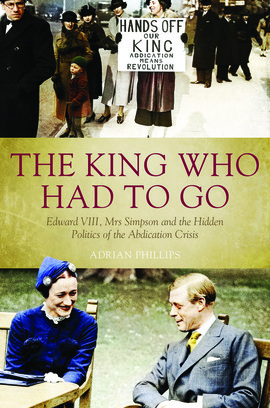 The relationship between Edward VIII and Wallis Simpson created a constitutional crisis that has fascinated the public for decades. Unwilling to accept the idea of the twice-married American as future Queen of England, the government was determined to pressure the King into giving up Mrs Simpson and, when that failed, into giving up his crown. The King’s phone lines were tapped by his own government, dubious police reports poisoned Mrs Simpson’s reputation, and threats to sabotage her divorce were deployed to edge the King towards abdication. The hopeless attempts of the King’s allies, particularly Winston Churchill, to keep him on the throne were dismissed as sinister conspiracy, whilst the King wrecked his own chances with wildly unrealistic goals and ill-thought-out schemes that served only to frame him as erratic and unreliable as a monarch. As each side was overwhelmed by desperation and distrust, Prime Minister Stanley Baldwin fought to steer events to a smooth conclusion. So much has already been written about the abdication of Edward VIII in 1936 that one wonders what more there can be to say. But Adrian Phillips has found a new angle by focussing on the role of senior Whitehall mandarins … He has also drawn on an impressive range of other contemporary accounts and diaries, many unpublished and some quite obscure, to produce an almost hour-by-hour examination of the scheming and calculations of a wide range of players with different agendas that led to the eventual result … Adrian Phillips has written an excellent book, which sheds fresh light on events with which many will think they are already familiar. Rigorous and absorbing in equal measure, The King Who Had to Go takes us far beyond government gossip and royal tittle-tattle. Phillips’s use of archival sources breathes new life into one of the most dramatic episodes in modern British history.